Congrats to our #MilkItForSpirit winner! 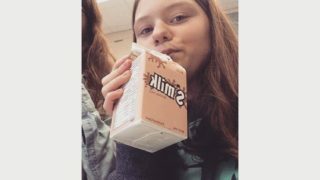 The School Milk Foundation of NL offered a social media challenge during the month of January 2017 called #MilkItForSpirit, where schools and students had the chance to post photos with their S’milk for the chance to win a Macbook Air. We would like to congratulate Gracie Button from Baccalieu Collegiate who was our randomly selected winner. Thanks to all of those who participated in our #MilkItForSpirit challenge. Stay tuned for another challenge coming up in April 2017 when we will be drawing for another Macbook! How much milk is produced here? There are 32 active dairy facilities in Newfoundland and Labrador, and they produce about 50 million litres of milk a year. That’s 200 million servings of milk.